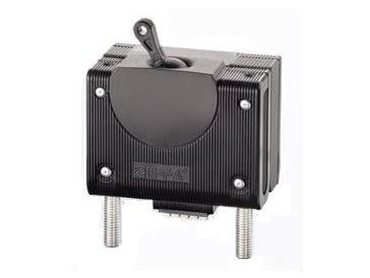 X8345-R actuation modules from E-T-A ElectroTechnical Applications have been designed for use with type 8345 hydraulic magnetic circuit breakers, allowing them to be remotely switched on or off. Once installed, these actuation modules allow the circuit breakers to be operated via either an external toggle or two momentary switches. This is particularly useful when the circuit breakers are difficult to access, or when the protective element is positioned at a distane from the control panel. X8345-R modules are easy to maintain, test and remotely diagnose, and are also suitable for use as a battery isolation system. When used as a battery isolation system, they can be implemented to spare battery power during lengthy lay days, or to avoid fire hazards when used with tractors or harvesters. These actuation modules weigh only 65 grams, and work with a control current of less than 3 mA, executing switching operations in less than two seconds. As with type 8345 circuit breakers, which are temperature compensated, X8345-R modules are suitable for use in environments with extreme ambient temperatures, operating between -40º and +85ºC.